Stun Gun Laws: Does Your State Permits You to Use Them? #1.4.1 What are stun guns? #1.4.2 Why is it illegal to own a stun gun in some places? #1.4.3 Do I have to conceal my stun gun? #1.4.4 Can I carry my stun gun with me? #1.4.5 Can I travel with my stun gun? Prior to purchasing a stun gun, it’s important to realize and acknowledge that some states have laws regarding stun guns. That being said, check out the places where it is illegal to own a stun gun, as well as some general frequently asked questions about stun guns, below! While you can legally own a stun gun in most states, it is illegal to own a stun gun in the District of Columbia, Hawaii, New Jersey, Massachusetts, Rhode Island, Illinois, Michigan & New York. Like cities, there are some countries where it is illegal to own a stun gun, even though you can legally own a stun gun in that state. The two countries where it is illegal to own a stun gun are: Crawford County, IA and Baltimore County, MD. Now that we’ve covered the basics about where it is illegal to own a stun gun, let’s answer some of the frequently asked questions about stun guns! #1 What are stun guns? A stun gun is basically a self-defense tool that is small and compact. It uses electricity to charge a current through a pronged head and into a target. Although stun guns utilize electricity, they are not fatal. Symptoms and time duration vary depending on the strength of the stun gun and the duration the stun gun made contact with exposed skin. For example, someone who was briefly stun gunned with a low voltage stun gun might feel a pinch and a little bit of confusion and shock. On the other hand, someone who was stun gunned for more than a few seconds by a stun gun with a high voltage would most likely be on the ground for at least ten minutes and would feel a variety of symptoms, such as disorientation, confusion, pain and loss of muscle movement. #2 Why is it illegal to own a stun gun in some places? Since there are a variety of reasons why it is illegal to own a stun gun in some places, we’re going to break down each reason. Firstly, some attorneys and professionals have argued that stun guns can cause serious injury and even death. Of course, anything could potentially cause serious injury and even death, especially when they’re misused or improperly made and regulated. Secondly, some places argue that stun guns should only be used with specially trained professionals, such as law enforcement, because they require skill and technique to adequately use that every day civilians would most likely not be able to obtain. Then, there is the argument that stun guns are useless to every day civilians because there are other ways that they can protect themselves, such as pepper spray. Also, stun guns aren’t protected under the Constitution, so some places feel like the argument that the access to own a stun is a natural right is invalid. #3 Do I have to conceal my stun gun? If you live in a place where it is illegal to own a stun gun, then this obviously does not apply to you. Otherwise, whether or not you are required to conceal your stun gun depends on where you live. Generally speaking, most places where it is legal to own a stun gun do not require you to conceal it. In order to avoid trouble with law enforcement, you should check the specific laws and regulations pertaining to stun guns on your state government website. #4 Can I carry my stun gun with me? If you live in a place where it is legal to own a stun gun, then you are most likely allowed to carry your stun gun with you. Like the previous question, you should check on your state government’s website or with your local law enforcement to obtain your area’s regulations. If your area has no regulations pertaining to carrying stun guns, feel free to carry your stun gun on you, in your purse, or even in your car. 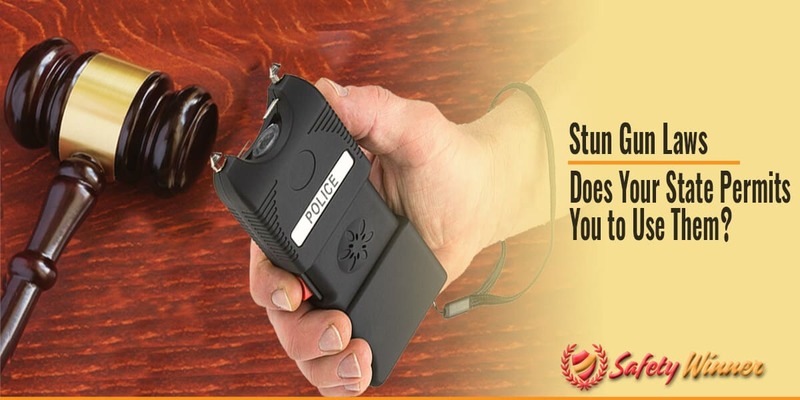 It’s important to consider carrying your stun gun with you if you have the option to because you never know when you it can be useful and even save your life. #5 Can I travel with my stun gun? The ability to travel with your stun gun is ultimately dependent on where you’re going, what type of transportation you’re using, and how you’re carrying your stun gun. A general rule of thumb is to leave your stun gun at home if you’re travelling internationally. After all, customs can be tricky if you’re just travelling with clothes. So, don’t risk running into any bumps during your travel plans, and just leave your stun gun at home. If you’re travelling domestically, it’s important that you check the state laws where you’re travelling. For example, if you live in North Carolina (where it is perfectly legal to own a stun gun) but are travelling to Hawaii (where you can’t own a stun gun), then you should leave your stun gun at home because it will most likely be possessed when you arrive. But, if you are travelling between states where you can legally own a stun gun, then it is okay to bring it with you. Another important thing to keep in mind is what type of transportation you’re using and how you plan on carrying your stun gun. For example, if you’re driving you should plan on keeping your stun gun in a bag or in a compartment in your car. But, if you’re flying you should plan on packing your stun gun in your checked baggage. In order to be safe, check out the guidelines for travelling with stun guns in your state as well as the place you’re going. What is a Stun Gun and How Does it Works? Stun Gun Training: How to Effectively Use Them for Self-Defense? Stun Gun vs Taser : Is a Stun Gun a Taser? 6 Myths About Stun Guns that Will Make Your Hair Straight!